Childs+Sulzmann Architects | You don't do residential design, do you? You don't do residential design, do you? Our reputation as architects has been built on the success of complex landmark projects, often with a heritage or conservation aspect and always with planning challenges. People are often surprised to learn that we also have great expertise in designing for workspaces, education, leisure and housing. Yes, residential! If you want a 100 unit development of 3-4 bedroom detached executive homes, then we are probably not the right choice. What we do is challenge the conventional to create individual living spaces for individuals. From social housing to unique contemporary detached homes, every project is an opportunity for excellent creative design that has no regard for location or size. We also love the challenges that pushing the boundaries brings! This was certainly the case recently when we received a commission which provided an interesting challenge where our expertise could unlock an opportunity for a valued client and produce a very special home for her and her family. The brief was to create a generous 5-bedroom house on a narrow sloping site on one of the most desirable residential roads in Cardiff. The access was challenging, the neighbours sensitive and the local architecture conservative. We worked with the client to maximise the opportunity on the site and to explore a language of modern materials, whilst ensuring that this would sit comfortably in the context. 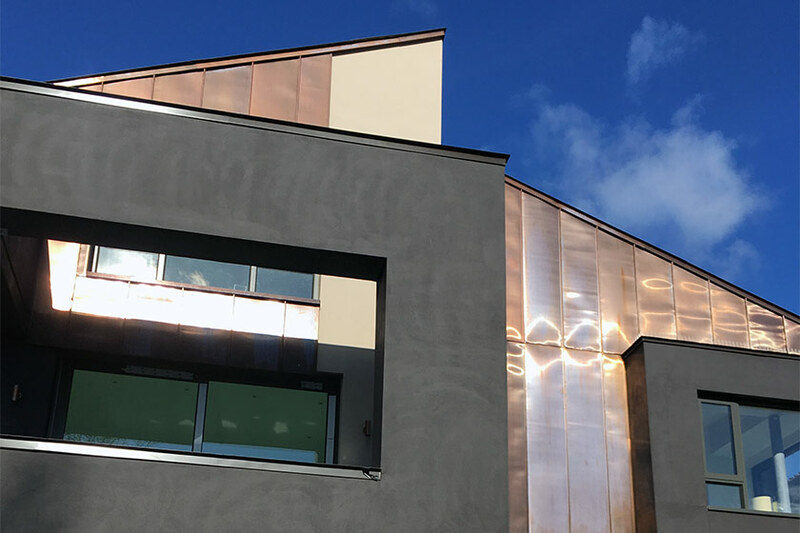 With some ingenuity and a degree of persistence planning consent was granted for a very contemporary solution featuring dramatic glazing, a striking copper façade and cantilevered bay windows. Not only is the client delighted with the result, but the neighbours are happy. In fact, the owner of a small property on a large plot nearby has asked us to consider demolishing their house and building something more exciting like their neighbour’s.